Who Pushes the Price up? 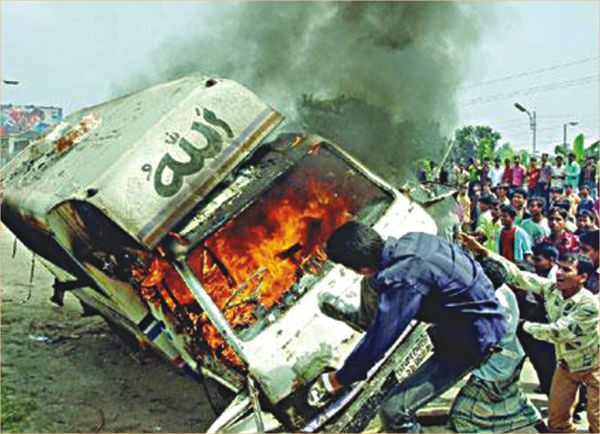 REFAYET ULLAH MIRDHA brings out the whole gamut of real causes that trigger incidents of frequent labour unrest in Ashulia and suggests ways to quell them. Everybody will agree that the ready-made garment (RMG) sector is the lifeblood for the Bangladeshi economy. Maintaining higher export growth every year, now the sector is the largest contributor not only to overseas trade but also to the national economy. The sector alone directly employs 3.5 million skilled, semi-skilled and unskilled workers. Indirectly, the garment sector, which started its journey in Bangladesh since the early 1980s, employs a few crores of people in the country. The multi-billion dollar worth garment sector has reached the current stage after a long struggle as Bangladesh does not produce the majority of its raw materials. Bangladesh is mostly dependent on imported cotton, fabrics, yarn and capital machinery. Yet, the country is in an advantageous position in global trade market for its competitive workforce. Despite all those troubles, Bangladesh is the second largest apparel supplier worldwide after China. The country is a lucrative destination to the globally renowned brands and retail chains like Hugo Boss, Adidas, Marks and Spencer, H & M, Zara, Olymps and many more because of price competitiveness, enhanced sustainability standards and skilled workforce. In spite of all the success stories, the garment sector is jolted with volatility. It faced severe labour unrest for wage hike in 2006. Since then labour unrest took place in the sector almost every year. Many experts and industry insiders describe it as a conspiracy by certain national or international vested quarters, although it requires adequate evidence to prove the involvement of such conspirators. Even during the latest labour unrest at Ashulia in May and June, the sector people, experts, researchers, government officials and lawmakers tried to know the real causes behind the unrest as it was not related to wage hike. Records show that almost all incidents of massive labour unrest, which have direct link with wage hike demand, took place in 2006 and 2010. Those incidents were resolved through discussion. In 2006, garment workers demonstrated for a minimum wage hike and it was fixed at Tk1662.50. In 2010 the workers agitated again for revision of the minimum wage structure. After negotiating for a long time, the government committee fixed the minimum wage for the garment workers at Tk 3000 per month which came into effect in November 2010. This year the nature of labour unrest at Ashulia was different. Primarily, the unrest started from a rumour of a death of a storekeeper at Ha-Meem Group in May 11. Later the problem of unrest was resolved for a brief period of one month when the missing Salman reappeared. But again the unrest started at the area despite repeated negotiating sessions among the workers, their leaders, government high-ups and the owners. When the unrest reached its pinnacle, the leaders of Bangladesh Garment Manufacturers and Exporters Association (BGMEA) were forced to keep shut 300 Ashulia based garment factories for a few days since June 16. After a series of negotiation between the stakeholders and the owners, the garment factories were reopened in June 21. In general, apart from wage hike issue, other causes for unrest in the garment sector are rumours of death and beating, fear of job loss, jhut business, cases with the police station, fear of shutdown of the factories, arrears of salary, checking at entry point and identity cards, pay hike and discrimination in grades, bad relations between workers and mid-level management, provocation by the local influential people and international conspirators and some NGOs, role of industrial police and division between industrial police and normal police, sudden order cut by the international buyers, piece rate production, problems of accommodation and increased house rent, lack of motivational training system, inflation and so on. We often think that labour unrest at garments is caused only by issues related to wage hike and hence most discussions focus a great deal on that. Therefore, it will be more enlightening to elaborate on the other real causes of unrest which are often kept out of public view. Rumour is a common problem in the garment sector. Very often rumours of deaths and accidents cause commotion among workers and resultantly, workers vandalise factories without checking up on the veracity of the rumours. Consider the following incidentas an example. A few years ago a large number of workers at a Gazipur based garment factory were stampeded and injured while they were coming down from the upper floors of the building after a rumour of a co-worker being attacked by a genie spread. Needless to say, the existence of the genie could not be found anywhere in and around the factory. The latest incident of unrest at Ashulia also started from a rumour of a missing Salman, a storekeeper of Ha-Meem Group, which was baseless. Sometimes workers, in fear of losing their jobs, engage in vandalism. They fear job loss for their misbehaviour with the seniors or if they are identified in any kind of violence. Jhut (the scrap of clothing items) is a very profitable business for a section of traders as the item brings them cash money. Previously jhut was a waste product of the garment factory but now it has become a by-product for its commercial value. As a result, some people, especially the locally influential people want to grab more jhut through influencing either workers or mid-level management of the factories. Many factories have faced unrest for the politics involved in jhut business. Filing of cases with the police station by the factory authorities on many an occasion have triggered labour unrest and work stoppage. When any kind of violence takes place at the factories, the managements and the local police file cases against hundreds of workers and the workers' leaders without mentioning their names. Police then search for the workers even after normalcy returns to the factories. Such objectionable police behaviour often results in clashes with the factory managements. In majority of factory closure cases, the managements do not follow the rules of law. Without serving any prior notice to the workers, they shut down the production units. As a result, workers get involved in clash with them and vandalise factories either for reopening production units or for arrear salary and other dues. Workers clash with the management for arrear salary and bonuses especially during the Eid festivals. The situation in salary disbursement has improved a lot as managements are now handling it professionally and have enhanced the compliances at factory level. Some severe labour unrest took place during checking the workers at the entry point of garment factories by the security guards. Workers engage in altercation with the guards when they ask them for identity cards during the checking. Sometimes workers forget to carry the identity cards. In such cases guards do not allow them to enter the factory. If a worker is unable to join work, he will miss the attendance bonus of that particular day. Incidents of unrest in November 2010 were only triggered by discrimination in salary hike and changes in grades. Many senior workers or operators did not get the salary at the proper grades although the minimum wage was implemented since that month. As a result, workers vandalised many factories. In the latest wage structure workers were categorised in seven grades. A section of workers started demonstration when the experienced and old workers were graded properly. Very poor understanding between workers and mid-level management is a perennial problem in the garment sector. Floor managers demand a quick delivery of works from the operators, but it might not be always possible. In such cases the mid-level officials engage in altercation with workers. Many mid-level officials were injured for bad relationship between workers and the management. Local influential people play a vital role in the sector. Local MPs have a great role to play, but sometimes they allegedly influence workers for some undue facilities. They use workers to establish their supremacy locally. They use workers to get jhut items and orders from garment owners for supplying materials, food items to the workers and other tenders. In cases of any outbreak of unrest, owners blame international conspiracy and NGOs overlooking the direct role local vested quarters play in the sector for business and political gain. The police force has a major role to play to quell garment unrest. 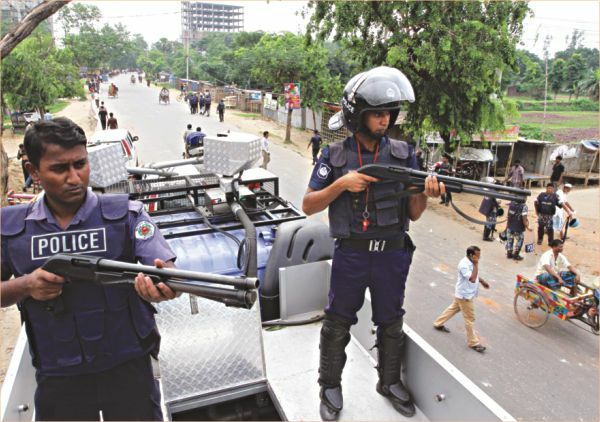 During the recent unrest in Ashulia, many questioned the roles played by the newly introduced industrial police. Some quarters say that a clear division has already been created between industrial police and the normal police force. Sometimes international buyers do not follow ethical buying practices. For different reasons they undercut the prices or reduce the volume of order. As a result, garment makers either delay in payment to the workers or deprive them as factory owners also become victims of order cuts and rate cuts. Ultimately, workers engage in clash with the management. Sometimes sweater factories are considered the source of unrest for mismatch in calculation in piece rate. Sweaters are produced under piece rate basis, meaning workers receive salary upon production. Sometimes workers are not paid in exact calculation of pieces at the end of the month. Suppose, at the end of a month a worker claims he has produced 100 pieces of sweaters while the officers calculate it to be 95. Many factories were vandalised for such wrong calculations in sweater factories. Workers do not have dormitories for their accommodation. As a result, they have to pay higher house rent. Owners of these houses in Ashulia have increased the rent four times in a year. Following such arbitrary moves, workers put pressure on factory managements to increase their salary and they take to the streets when managements do not increase the salary. According to present estimate, the country's more than 5,000 woven, 1,700 knitwear and nearly 1,300 spinning, weaving, finishing and dyeing factories suffer from shortage of 25 percent workers. Currently, 3.5 million workers are employed in the sector. They do not have institutional training on production management, organisational behaviour and adaptability but they are the most important part of the multi-billion dollar garment business. If they were trained properly, they might not engage in frequent unrest. Spiralling of prices of basic commodities is a major source of unrest. For example, prices of four eggs are Tk 40, which only five months ago were Tk 24. Similarly, prices of almost all commodities have increased. As a result, workers always bargain with the managements for pay hike. Being a business journalist and having covered the garment sector very often I have to face a question as to why the unrest starts always from Ashulia. The answer is not easy. It was in 1998 when the majority of the country's areas were inundated by devastating flood. Then entrepreneurs concentrated on the upper lands in Savar and Ashulia areas. Moreover, in Ashulia, the gas pressure, one of the main elements for factories, is higher than other areas of the country. Generally, people say the over density of factories and workers is the major cause for unrest in Ashulia. The distance between Ashulia bridge and Baipail will be three kilometres but the number of factories in such a small area is more than 300, employing thousands of workers. The political turmoil in this area is also responsible for frequent unrests. Many think that the jhut trading among new businessmen and locally influential people is another major cause for unrest in the area, which is not so acute in other areas like Gazipur. Apart from jhut trading, locally influential people engage in clash to win the bids for supplying daily meals, breads and banana to the workers at factories. 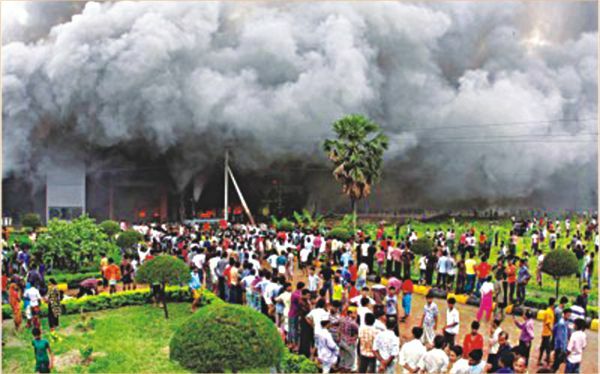 The misbehaviour of the mid-level management is also responsible for unrest at the factories in Ashulia. Overall, local lawmakers have a vital role to play in managing the situation. The latest unrest in Ashulia started from a rumour of death of a worker named Salman at a unit of Ha-Meem Group in May 11. The situation calmed down when missing Salman reappeared before his colleagues and the media. But the unrest again erupted when another rumour of shutdown of a unit of an Ashulia based factory and torture on workers by the factory management started to spread. The unrest continued and at one stage workers started demanding salary hike to cover for their higher house rent. The situation was brought under control through negotiations among workers' leaders, owners and government high-ups. Several studies including McKinsey report last November substantiated that Bangladesh has an immense potential in garment business in the coming years. The international buyers are shifting to Bangladesh with increased number of orders as the cost of production in other competing countries including China soared abnormally. We must utilise the opportunity because RMG has opened up the country's economy. The importance of the sector is immense to the national economy. All problems should be resolved amicably without harming the sector's growth. The government should substantially help produce skilled workers. Utmost importance to both private sector entrepreneurs and the government is maintaining a warm relationship with major exporting countries for sustainable business growth. The government and the private sector should follow the trends and dynamics of world garment trade because this trade moves globally based on different treaties and agreements. For example, the signing of the Free Trade Agreement (FTA) between India and the EU, the largest export destination of Bangladeshi garment items, might harm the Bangladesh's business in the Eurozone. Currently, Bangladesh enjoys duty-free benefit in the EU-27 under Generalised System of Preferences (GSP). If India, a developing country, also enjoys the same facility in the same market, Bangladesh will not be able to compete. The government should work on the issue. The government must strengthen the lobbying with major economies to sustain the business. Garment manufacturers should enhance their negotiation capacity with the international buyers. India has an added advantage of raw cotton and capital machinery with improved infrastructures. The government should keep eyes on such business dynamics worldwide and should take actions accordingly so that Bangladesh can also take a big pie from the trade deals. Bangladesh must explore new export destinations like Japan, South Korea, Malaysia, South Africa, Brazil, Chile, Mexico, Australia, New Zealand, China and India. The government should supply adequate gas and power to the industrial units. Port efficiency should be enhanced and the government must improve the infrastructures. Refayet Ullah Mirdha is Business Correspondent, The Daily Star.